Our school needs to grow. A bigger school means a more vibrant community, better facilities for more children and the means for increased recognition for all our wonderful, generous and dedicated (often volunteer!) staff. Word of mouth is the number 1 way of growing enrolments so please share this with everyone. 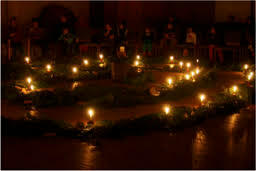 Mid-winter took us deep into the centre of the spiral of the seasons, into the darkened days and reflective activity. We've had lashings of rain and wind and even a spot of hail, and yet we feel that the direction of our journey has now changed and ever so slowly we are heading back out into the light. This is a testing time. Colds and flus have left us exhausted and mud traipsed through the house and our lives means more cleaning than usual. It is a time when we need courage, when we need to be the birds singing, though dawn has not yet broken. We give our friends gentle encouragement and slowly build up our reserves again for the outward exploration which will come again all too soon. Here in the office we are still wading through the non-government school Registration Application which requires around 70 lengthy documents to be written and submitted. It is an arduous task but we are beginning to see a small glow of light at the end of the tunnel. This school requires the help of the whole community so please see the P&F news below for how you may share the load and help create something wonderful for our children. Lastly, the Midland Reporter came yesterday to take a photo for an article on our school - so watch out for the next edition! Looking for special handmade gifts? Natural craft supplies to get creative with? 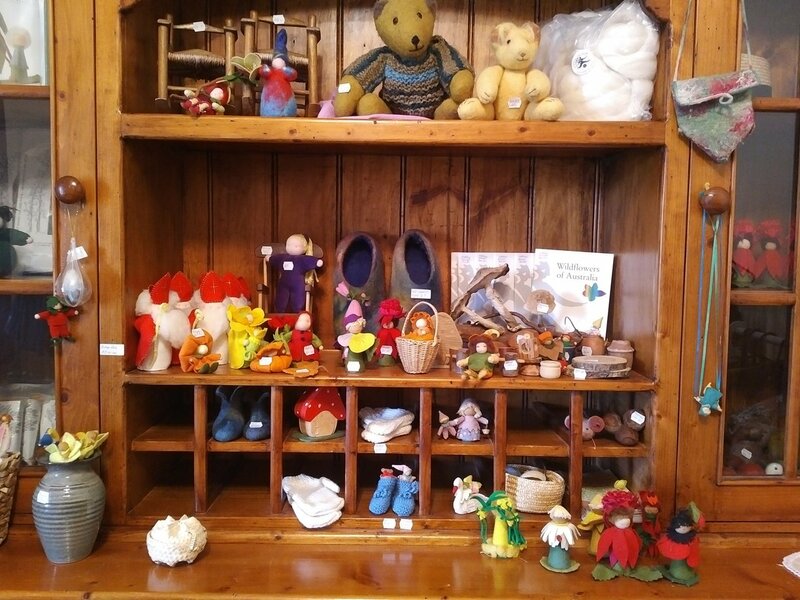 Our school shop has a range of beautiful, one-off, handmade, natural fibre items for sale. We also have children's and adults pre-loved clothes. We are very excited to have Joanne join us on Mondays and Tuesdays. Joanne shall be heading up our music lessons as she is a very experienced musician (wind instruments). I can already hear the improvement in their playing. We are also very lucky to have Carmen (Nate’s Mum) to teach us AUSLAN Australian sign language. This is proving to be very enjoyable and we often practice greetings, spelling and questions during the week. On Thursdays we are fortunate to have a local artist, Alex Stevens come in and give lessons. Last week we learnt how to identify shapes we can see on an Ibis waterbird and how our minds can often trick us into drawing things that we think should be there. Mondays also bring us Carol Fuller, an experienced craft teacher who helps the students master the arts of knitting, felting, weaving and more. Currently the students are making recorder cases for their recorders. Additionally, Caz Bowman, Specialist Senior Teacher has been teaching us some Noongar songs and language and we are practicing for our Spring Festival. So we have a lot of wonderful support and expertise coming into the classroom this term which is sensational. For the past three weeks we have been learning about Brother Francis of Assisi and we will finish this block of work this week. It is a compelling story about an Italian boy who came from a wealthy family who gives up his comfortable, carefree life to devote himself to preaching God's word and caring for the poor. This story is rich in imagery and has an underlying theme on the beauty of nature and caring for each other. Very nurturing for the students. Our whole day excursion shall be to explore the freshwater fish, molluscs and crayfish that can be found in the local area. We shall be making and using traps to catch freshwater crayfish and studying the freshwater mussels that can be (hopefully) found in the waterways. We will also walk to the Swan View Tunnel, via the National Park Falls, whilst we are waiting for our traps to work if time and weather permits. The walk shall be along the old railway tracks which is very easy walking, about 4 kms in total for the day. Beautiful area to explore. Continuing on with our Nature theme this term, we have been invited by the Midland Junction Arts Centre to enter the SEAP 2017. This is a great opportunity for the students to investigate the hidden habitats hiding under leaves and present artistically what they find. There are lots of prizes up for grabs and the winning entries will be printed onto the street banners that line Midland, Mundaring and Guildford. Thank you for your continued support in making our humble school a fantastic place to be. We hope you are all having a warm and happy start to Term 3. There are a few things happening this term we'd like to share with you. Firstly, the wonderful Sarah (Daisy's mum) has left us to take a teaching position overseas for a couple of years. We will miss her zest and productivity dearly. Secondly, our lovely Kate is expecting her second baby later this year so will be stepping back from all her great work on the P&F. Warmest congratulations Kate! In light of these departures, we are looking for new members to join the Parent and Friend Committee. Please contact me (Gwen) on 0434 915 185 or at lunarfeye@gmail.com for more information. Come along and meet fellow parents and friends of Helena River Steiner. This term we have planned an adult only catch up in the evening with the hope of escaping the business of parenting for a few moments and enjoy a peaceful drink with others in our school community. Many hands make light work. Join us in improving the grounds for all our little ones to enjoy. Morning tea and snacks provided. Please see the board closer to the date of jobs that need doing. This term we are having a sausage sizzle fundraiser at Bunnings in Midland on the 26th of September. It is a Monday on a long weekend. Forms will be placed around the school shortly for you to select a time you may be able to assist us. Our lovely school has now got its very own shop, to help raise funds for the school. If you have a hankering to try your hand at some Steiner toy making, our little shop is a great place to start with some simple kits to get you started. If you feel you need a bit more direction, the crafting group meets every Friday morning in the Playgroup room. You will find all the assistance you could need in a lovely environment complete with a cuppa. Younger children are welcome to come and play. .Note: Ladies, if you routinely cut the hanger ribbons out of your new items we can recycle them for swing tags. 2. Donating time to man the shop. We currently have Fiona and Bec opening the store three days a week but if you find yourself with a morning free after drop off and would like to be at the helm, we welcome any assistance. 3. Making simple craft items for the shop. Either join the craft group on Friday mornings or ask us for a take-home kit. We have pre-cut patterns you can take home and make up. 4. Steiner dolls. If you are a very talented crafter, we would like to work towards a commissioned doll line with customers able to place an orders. These would be priced such that the doll maker gets paid and the shop takes a commission. 5. Wooden toys and play equipment. If you are a woodworker and can make commissioned pieces, we would love to talk to you. We greatly appreciate your support of the school and look forward to achieving great things. 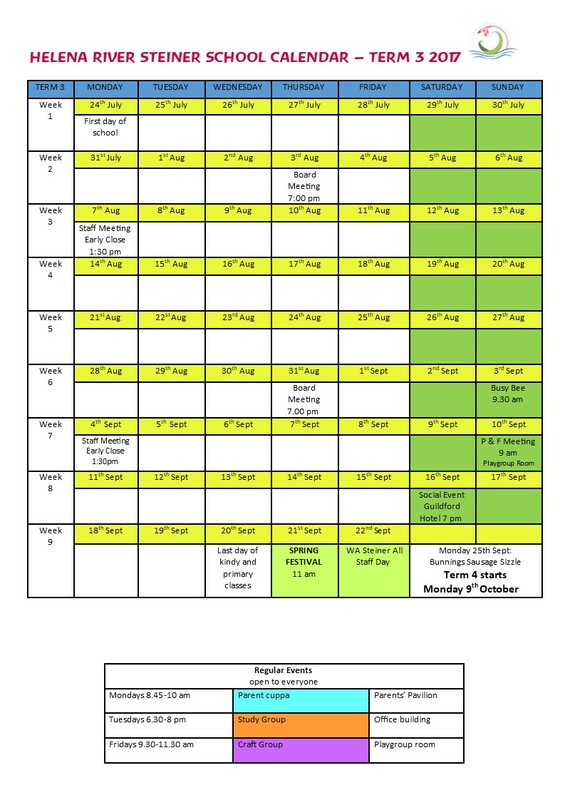 Please print out a copy of this term's calendar so you can be prepared for events, or check the calendar on our website regularly. 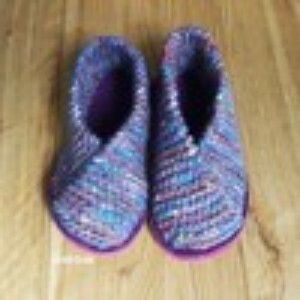 KINDY PARENTS - Please bring in a pair of inside slippers for your child to stay at school until warmer weather. As a paediatrician, I actually was taught that you could tell if children were warm enough by touching their skin. If they felt warm then they were wearing enough clothes, and if they felt cool or their skin was mottled (bluish-pink), then they needed more clothes. It was simple. I was also a parent that had her 2 year-old child playing outside in the rain wearing only a diaper. I actually thought he was okay because his skin felt warm! Warmth is probably one of the greatest gifts we can give our children. Not only the warmth of our love but also keeping their physical body warm. Children are developing their bodies especially during the first 7 years of their lives. An infant and a young child will always feel warm unless they are on the verge of hypothermia because they have an accelerated metabolic rate. If we don't provide them with the layers of cotton, silk, and wool to insulate their bodies, then they must use some of their potential "growth" energy to heat their bodies. This same energy would be better utilized in further developing their brain, heart, liver, lungs etc. In addition, being cold decreases immunity. We are all more susceptible to the germs and viruses that are always around us when we are wet and cold. When our body has to expend extra energy to keep warm then less energy is available to "fight" off infections. So the question becomes, how do we get our children to wear jackets? One can develop the habit of always having children put on a hat and coat when they go outside during cool weather. One can also try telling children that they will actually run faster and have much more energy to play if they wear a coat. If they don't wear a coat then their body has to expend a lot of energy just warming them up, and they will have less energy to build muscles and less energy to play. Finally, the type of clothing our children wear also makes a big difference. Polyester pajamas don't breathe and children will often wake up sweating. Even polyester jackets will not insulate a child from the cold as well as layers of cotton, silk, or wool. 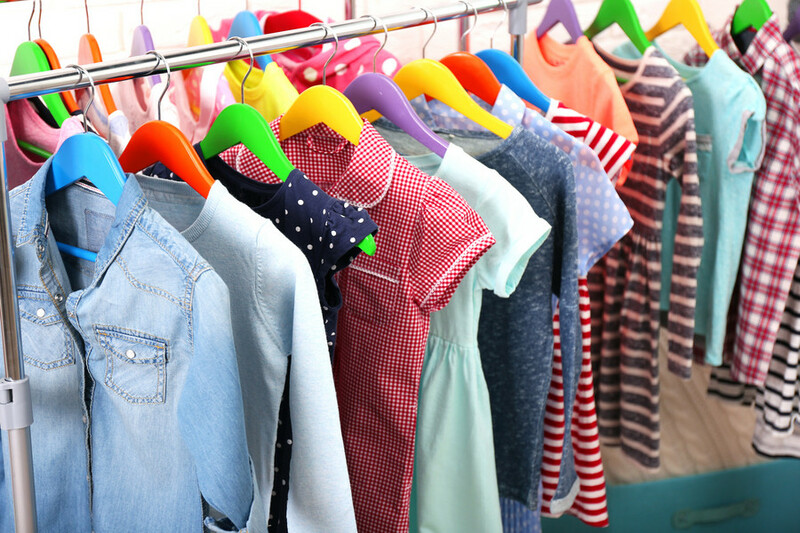 When children sweat while wearing polyester that sweat is trapped against their body and they eventually become chilled. So why do children rarely complain that they are cold? Children often are not connected with their body before the age of 7 to even acknowledge or communicate that they are cold. They live in the moment and are so excited and stimulated by all that they see that they don't have the capacity to sense the coldness of their body. This is why children often will play in a swimming pool or ocean until they are literally "blue" denying that they are cold or that they need to come out of the water. So as parents, we have to help our children develop their sense of warmth. By helping them develop this sense of warmth, we are actually strengthening their immunity and laying the foundation for a healthy body and healthy organs in their adult life. 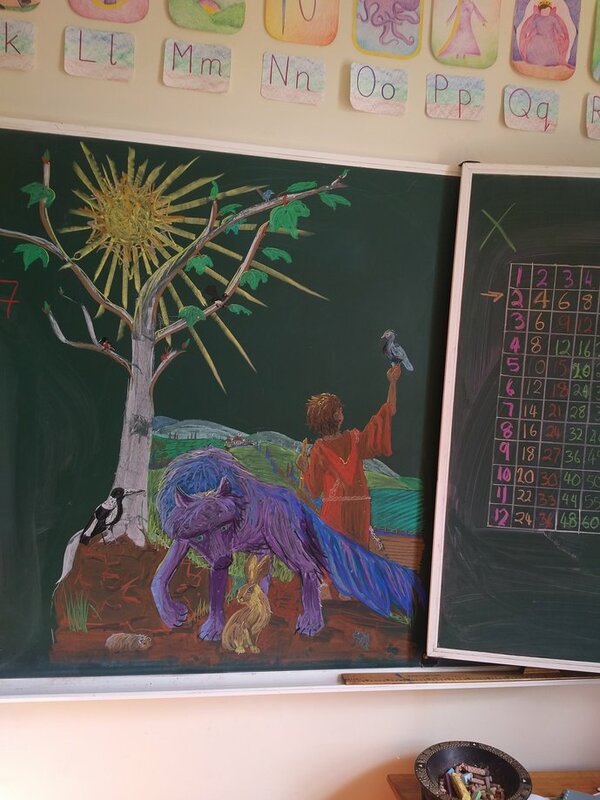 West Coast Steiner School, 15 Mayfair St, Nollamara. A lecture for parents and teachers as part of the whole school program. The lecture helps to recognise the relevant depth and progression anthroposophy brings to this important aspect of life and the responsibility of community in raising children and working together to promote individual wellbeing. It will cover how and when we work with children and adolescents to bring the understanding of sexuality and gender in relation to where they are in their consciousness. This brings harmony between the evolving body and inner experiences that sets the ground for healthy adult experience. The talk will cover the themes of the content brought to the students and some of the main issues confronting child health and wellbeing in current times, with examples of how we can counter the unbalancing effects. We also address how to understand gender differences and similarities that both limit or free us and the contribution and struggles of the changing social structures around gender and sexuality affecting us all. Many of you will know Lisa Romero, whose courses and workshops on inner development have met with wide appeal both in Australia and overseas. Lisa is an author of inner development books, a complementary health practitioner and an adult educator who has been delivering healthcare and education enriched with anthroposophy for 25 years. From an esoteric view of the human being, it can be understood that within the individual there are masculine and feminine forces that are necessary for deeper soul development. You are receiving this because you are currently enrolled in a Helena River Steiner School program, have enquired about a Helena River Steiner School program, or are a member of our community. Copyright © 2016 River Blossom Education Association Inc, All rights reserved.